Wave bye-bye to 90 minutes of your precious time. Though a booming surplus in the 1980s, horror movie icons have becoming a scarce commodity in recent years. The glut of villains such as Freddy Krueger, Jason Voorhees, Michael Myers, Chucky, Leatherface, Pinhead and the Tall Man never really found a second generation in the decades since. Ghostface from Scream—more a title than a character, anyway—was the closest thing to come out of the ‘90s. The Aughts had a bit more luck, at least in the form of The Ring’s Samara and Saw’s Jigsaw, but even then, it wasn’t quite the same as the old days. Now, in the present day, horror shingle Blumhouse is breaking their backs trying to generate the next big icon, but the likes of Doris Zander and Bughuul aren’t quite sticking the way they intend them to. I bring this up because The Bye Bye Man feels like a very self-conscious attempt at filling that void. Its titular monster, a clawed, hooded specter (he sort of resembles a taller version of the Emperor in Return of the Jedi), is clearly intended to emerge onto the scene as instantly iconic. He even has a hook (not literally, like on his hand) in the form of a (very poorly rendered) demonic hound that he keeps as his trusty companion. But as a character, the Bye Bye Man is all surface. He isn’t that spooky in his presentation and he doesn’t have a neat gimmick (that dog is more of a head-scratcher than anything truly intriguing). A proper horror icon doesn’t require both of those traits, but he or she needs to have at least one. You’re not getting on base with neither. The film opens with a decent jolt in the form of a flashback, as a man pulls up to a house and asks the woman inside if she has mentioned a mysterious name to anyone. Upon hearing that she has told her family the name, he returns to his vehicle, produces a shotgun and proceeds to murder the home’s occupants. That the scene unfolds in quiet, sun-dappled suburbia gives it an unnerving power that the rest of the film will never again summon. From there, we move to the present, where Eliot (Douglas Smith), a fresh-faced young go-getter on a college scholarship, is making plans to move into a somewhat run-down house off-campus with his perfect girlfriend Sasha (the flat-voiced Cressida Bonas) and jock-bro best bud John (Lucien Laviscount). That the trio appear to be the hap-hap-happiest group of pals in existence only portends their doom that much more clearly. After a few bits of scattered spookiness manifest, Eliot finds that the interior of the master bedroom’s nightstand drawer contains furious scribblings of the phrase “Don’t think it, don’t say it,” with the words “The Bye Bye Man” etched beneath the drawer liner. 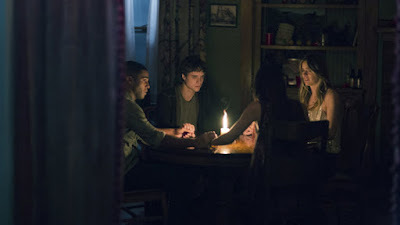 During an impromptu séance with budding psychic Kim (Jenna Kanell), a coed whose acquaintance the group made at their housewarming party, Eliot blurts out that name that he wasn’t supposed to think or say and events immediately take a perilous turn. Eliot hears dreadful scratching on the exterior of the house at night. Sasha appears to fall ill. John experiences disturbing visions. The entire group beings to see events that are transpiring only in their own minds. This figure, the Bye Bye Man, is attempting to destroy them by driving them insane. Eventually Eliot discovers that the only way to stop this plague is to eliminate everyone who knows the fiend’s moniker, and to prevent anyone else from learning it. 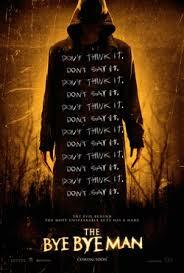 The Bye Bye Man owes many debts, the largest being to A Nightmare on Elm Street and The Ring. As with the former, this concerns a monster who torments the minds of a group of teens, contorting reality to destroy them. With the latter, it borrows the conceit of a curse spread via exposing others to the means of contracting it. The problem is that the film doesn’t have anything clever to add to these ideas. Freddy’s dream haunting was an inventive concept, bending perception by blurring the lines separating the dream world from the real one. This film’s Freddy surrogate doesn’t bring anything that nifty to the table. He just makes people hallucinate horrible things. Similarly, The Ring’s cursed videotape was a fantastic merger of the technological with the metaphysical. Here, it’s just a name being uttered that dooms you. It’s all very prosaic and dull. Also prosaic and dull is this film’s cast. The characters have no depth even by the historically low standards of the genre. Eliot is a nice boy, Sasha is a nice girl, John is a nice meathead and Eliot’s brother Virgil (Michael Trucco) is protective of his little brother. That’s all there is to know about any of them. As with the villain, these characters are three-sheets-deep pencil shadings of characters from similar, much better movies that came before. Most tragically, as the film goes on, it brings in actual good actors like Carrie-Anne Moss and Faye Dunaway and then wastes them in bit parts far beneath them. The film also doesn’t seem to have pieced together the components of its own would-be mythology. Train imagery is a predominate theme in the film, straight away from the opening credits, yet though one character is eventually killed by a train, there is nothing to explain the significance of the motif given how often it recurs throughout. Similarly, mysterious gold coins are also a part of the Bye Bye Man’s signature, without explication. I certainly don’t call for every enigma to be pinned down during a horror film, but given the prominence the film gives these two elements and how intrinsically un-scary trains and gold coins are, to leave them unexamined doesn’t score the film any points. In the past year, we saw several seemingly unappetizing horror entries emerge as surprisingly decent, if still not instant classics. Lights Out, Ouija: Origin of Evil, Don’t Breathe, The Boy and The Shallows were all fairly solid efforts, despite looking wholly unremarkable at a passing glance. Even last year’s entry in the historically undistinguished early-January horror slot, The Forest, while certainly not very good, wasn’t altogether awful. 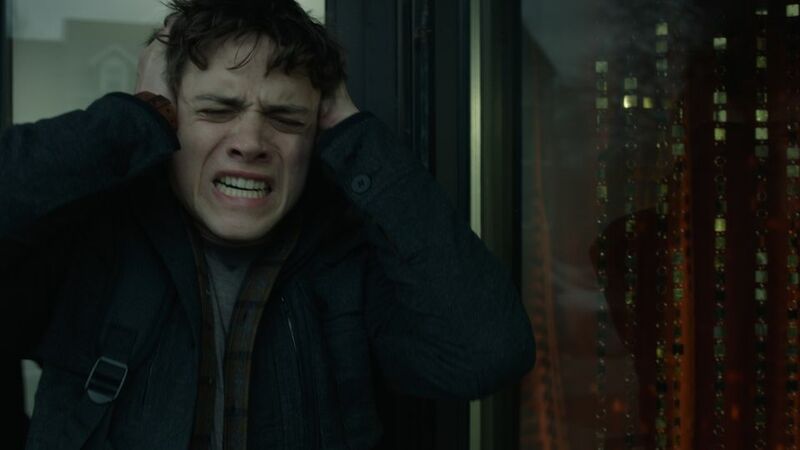 The Bye Bye Man does not merit entry into even this realm of faint praise. It’s horror at its most slapdash and lazy. If you’re seeking something to watch, don’t think it and don’t see it. Discuss this review with fellow SJF fans on Facebook. On Twitter, follow us at @SandwichJohnFilms, and follow author Brandon Wolfe at @BrandonTheWolfe.